It’s been snowing all day in my corner of the world. The sky is grey and the snow is so thick that you can’t see more than a few feet in front of you when you step outdoors. With a grey, blustery, wintry day ahead of me, I turn to the kitchen for warmth and I find a bag of lemons waiting for me. Lemons are in season right now, one of the only bright things produced in winter, which tells me that Mother Nature understands comfort food. 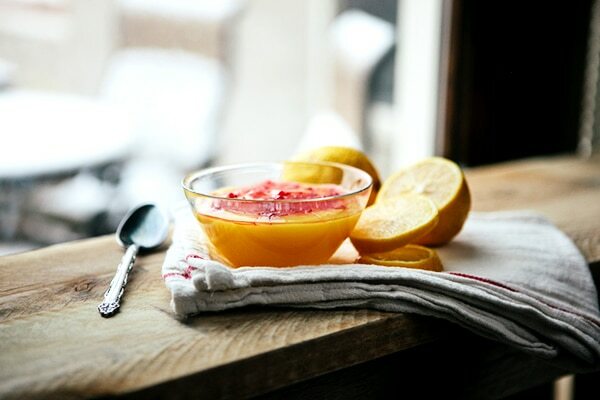 Surely She knew that a warm bowl of Lemon Pudding could bring a little ray of sunshine on a cold winter’s day. On its own, the lemon pudding is tart, creamy, and delicious. With a heaping spoonful of Raspberry Sauce drizzled over the top of the citrus dessert, the lemon pudding is incredible. I knew I stored away those freshly picked raspberries last fall for a good reason. Thawed today and elevated to a pudding topping, they made six more weeks of winter seem bearable after all. Mix sugar and cornstarch in a medium sauce pan. Gradually whisk in water and cook over medium heat. Stir constantly until mixture thickens and boils. While constantly stirring, boil for one minute. Gradually stir half of the hot mixture into the egg yolks. Blend back into mixture in pan. Boil and stir one minute. Remove from heat and stir in butter, lemon peel, and juice. Combine sugar and water in a small saucepan. Cook over high heat, stirring constantly, and bring to a boil. Reduce heat, and simmer until sugar is dissolved. Remove from heat, and allow syrup to cool completely. Place raspberries and syrup in the jar of a blender; puree until smooth. If you want to remove the seeds, pour through a fine sieve. Drizzle sauce over the lemon pudding and serve. Do you have a favourite lemon dessert? Lemon desserts are lovely after hearty winter meals. Blueberries would be a nice topping as well. SO cheery and comforting! Pudding is one of my favorite treats, especially on a blustery day, and I love the lemon/raspberry combo. It would brighten up any snowstorm! My son LOVES lemon desserts; so I have tried a variety of recipes over the past few years. This year I made a Martha Stewart Lemon cake that was out of this world! ( http://www.marthastewart.com/632498/lemon-cake ) Of course I added my own variance with my own frosting (lemon cream cheese!). It was a big hit. This looks so dreamy for a snowy winter day… It’ll be on my list! yummmmmmmy- I love citrus in winter! I just made this–Yum!!!!!!! Do you chill it first or eat it warm? This looks very, very delicious! 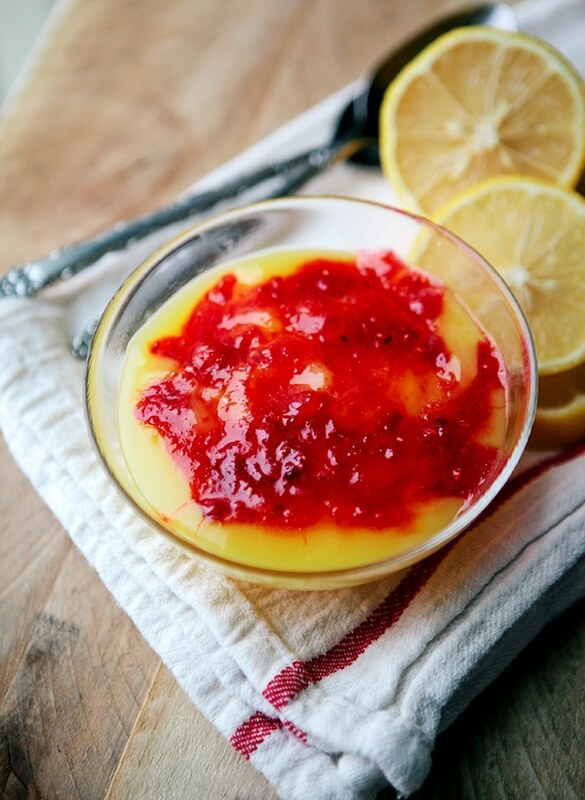 Lemon pudding and Raspberry sauce, yes please!